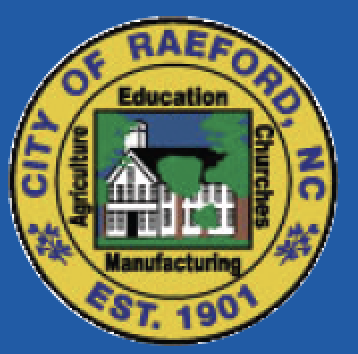 The city seal of Raeford, N.C., is as honest and no frills as the work ethic and culture of its residents, which number slightly less than 5,000. Centered on the seal is a depiction of the Raeford Institute, a facility of higher learning established in 1895, predating the town by half a dozen years. The image is circumscribed by references to the town’s quartet of signal historical attributes: education, churches, manufacturing and agriculture. Raeford, county seat of Hoke County, was established in 1901. It originated from a settlement founded by John McRae, who operated a turpentine distillery, and A. A. Williford, who owned the local general store. The last syllables of their respective surnames were combined to form the name of the post office they established and later the name of the town settled largely by Gaelic-speaking Highland Scots. The four characteristics on the seal facilitated Raeford’s historical growth and marked the foundation of the town’s culture. Within 10 years, student enrollment had grown to more than 300 and the school operated for several decades, educating many of the town’s well-known early denizens. Manufacturing: Raeford is home to components of several international corporations, including Burlington, a global leader in textiles; the cosmetic division of Unilever; and Sun Path Products, a maker of skydiving equipment. Agriculture: Raeford’s diverse agricultural mosaic includes cotton, poultry, livestock, ornamental nurseries, logging and forestry. Turkey farming is prevalent, with Butterball maintaining a poultry processing plant in town. Raeford could very well add two modern characteristics. Recreation: Raeford boasts museums, theaters, historic sites, some of the best public golf courses in the region and the world’s largest vertical wind tunnel where patrons can simulate skydiving. For more serene entertainment, the town offers quaint village shops and a diverse selection of restaurants.